In the aftermath of the Great Recession the number of students living in poverty is continuing to increase. That is the key finding of seven years of data taken from every public school district in the country. This data was organized geographically by EdBuild, a new national nonprofit focusing on funding for public education. As EdBuild reports: In 2013, there were 26.3 million students living in high-poverty school districts (those with child poverty rates of 20% or higher) throughout the United States. This represents an increase of 60%—9.7 million children—since 2006. Even more alarming, there has been a 260% increase in the number of students in concentrated-poverty school districts (whose poverty levels are 40% or above). These concentrated-poverty areas pose heightened risks to child well-being and opportunity. The data for the project comes from the U.S. Census Department’s Small Area Income and Poverty Estimates (SAIPE). The interactive map below shows precisely how this phenomenon is spreading across the country. The map allows you to zoom in and out to focus your search nationally, at the state level, or even all the way down to your hometown or school district. Areas that rise above a twenty and forty percent poverty rate are what we consider high-poverty and concentrated poverty respectively. The neighborhoods and school districts with this level of poverty have a profound impact on childhood development and student achievement. A student is considered “at poverty” if they come from a family that lives at or below the Federal Poverty Level (FPL), a measure of income level issued annually by the Department of Health and Human Services. According to the national guidelines, the FPL for a family of four is a household income of $24,250, compared to $20,090 for a family of three, and $15,930 for a family of two. As of 2013 more than 41.8% of all students in Michigan reside in high-poverty school districts. 12.2% of students live in concentrated poverty (40+ %) school districts. This is a rate that is three times higher than the national average of 4%. The number of Michigan's high poverty school districts has doubled—from 120 in 2006 to 243 in 2013. According to EdBuild CEO Rebecca Sibilia, "This is a significant problem because decades of research proves that students in high and concentrated poverty areas need far more support than their better-off peers. Yet Michigan has a regressive funding formula, in which districts with high poverty levels receive, on average, $500 less than other districts." According to the most-recent 2013 Census data, Detroit Public Schools have a 51% poverty rate, compared to 51.8% for Flint, 35.6% for Lansing and 11.2% percent for Ann Arbor. This latest news isn’t further proof that the issue of student poverty is rising to the crisis level. It was big news last January when the Southern Education Foundation released data showing that for the first time in over 50 years, the majority of public school students were now living in poverty. The report found that 51% of students in pre-kindergarten through 12th grade in the 2012-2013 school year were eligible for the federal program that provides free and reduced-price lunches—a statistic that is often used as a proxy to measure poverty (though there is some debate on how accurate the measure is). Some states stand out as having seen particularly severe slides toward poverty. In 2006, 6% of Florida students went to school in high-poverty districts. By 2013, the number had risen to 76% of the state’s school-age children were living in high-poverty districts. 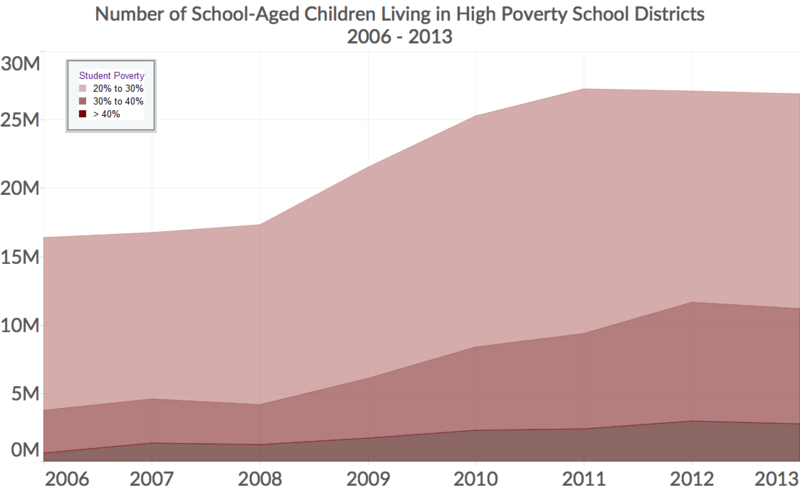 California saw an increase of over 1.5 million students in high-poverty schools. The disparities between neighboring districts provides insight showing that, not only are students increasingly poor today, but that this kind of economic segregation is increasingly clustered in the nation’s public schools, creating a system of have and have-not districts.